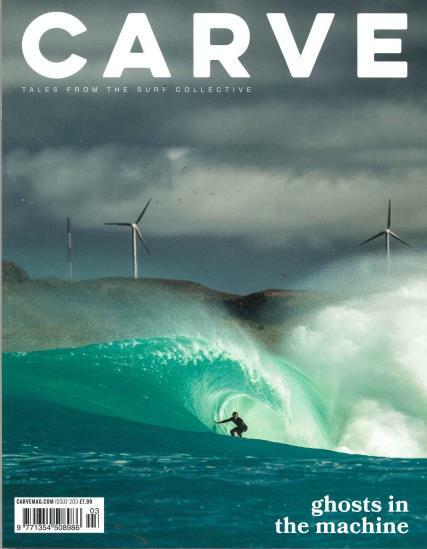 Carve magazine is the UK's best selling, biggest and brightest surf title. Featuring bleeding edge surf photography, top notch features and all the best bits we can find in the surfing world. Buy a single copy or subscription to Carve magazine. The magazine is exceptionally high quality and wonderfully laidback magazine devoted to surfing and surf culture. It is gorgeously designed and produced – and impressively packed full of content – publication has an authentic feel to it – it is written by surfers, for surfers. Each issue includes an array of well written and often entertaining features examining different aspects of surfing in the UK as well as surf culture in general. It also offers details of the best gear and kit, such as board shorts, fins and boards for both men and women, and some absolutely stunning photography throughout.